Manhattan decorative floor register covers in the popular satin nickel finish. 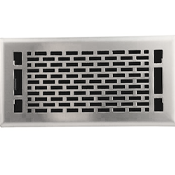 The floor register covers are made of steel with a durable tarnish and corrosion resistant satin nickel finish. 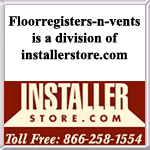 Trusted Accord brand floor vents come with a plastic damper that allows for air control. The ABS resin plastic drop in damper is rust proof. This satin nickel floor register is available in sizes 4x10, 4x12, 4x14 and 6x10. 61-0933 4 x 10 5.25" x 11.5"
61-0934 4 x 12 5.25" x 13.5"
61-0935 4 x 14 5.25" x 15.5"
61-0936 6 x 10 7.5" x 11.5"
This attractive Manhattan decorative floor register design is also available in the finishes Oil Rubbed Bronze and Antique Brass.